Looking for genuine wood smoked flavor? Look no further. Napoleon charcoal grills deliver great flavor in a variety of grill styles. Napoleon smokers allow precise grilling and smoking for the BBQ connoisseur. With a history of making quality BBQ grills as early as 1976, you can trust that Napoleon will meet your expectations for both quality and style. There are four great collections to choose from: Professional, Pro, Apollo, and Rodeo. Choose from a selection of models depending on the type of griller you are. If you like to smoke low and slow, try the Apollo 3-in-1 charcoal meat smoker and grill. For a more commercial look, you might be more interested in the Professional Freestanding Grill made of 304 stainless-steel. 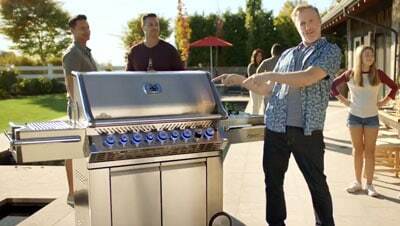 If you’re looking for a kettle grill, there are two 22-inch grills available. The Rodeo has a hinged grate – perfect for adding additional charcoal while cooking. If you’d rather have a side table, go for the PRO freestanding kettle grill. Napoleon Professional freestanding charcoal grills have an adjustable charcoal pan for multi-level heat control. The adjustable charcoal bed makes raising and lowering the charcoal bed a snap for multi-level heat control. Controlling the temperature is made even easier with adjustable air vents. Create restaurant quality food with the unique charcoal powered rotisserie burner. Just load up the specialized basket and enjoy your rotisserie creations. Easily add charcoal to the grill with the front-loading charcoal access door. Feed a large group of people in no time with 605 square inches of grilling space – you can cook up to 32 hamburgers at once to feed your hungry family and friends. Constructed of long-lasting 304 stainless-steel, you’ll enjoy grilling on your Napoleon Professional for many years to come. Napoleon Pro charcoal kettle grills feature a stainless-steel folding side shelf perfect for food preparation. Monitor and control your temperature with the Accu-Probe temperature gauge and stainless-steel air vents. Cast iron cooking grates are hinged so you can easily add more charcoal while you’re cooking and it can be adjusted to three different height positions. If you need to feed a lot of people, you can grill up to 23 hamburgers at once on this grill, which also offers a stainless-steel heat diffuser that evenly distributes heat to your grates and food. Napoleon Apollo 3-In-1 charcoal meat smoker and grill is very versatile. You can transform it from a compact portable grill to a two-tiered or three-tiered smoker in a matter of minutes. The chrome plated 19-inch cooking grates are large enough to handle big slabs of meat. The easy access door allows you to add charcoal or wood chips quickly to keep the smoke going. You can even hang your meats on the included stainless-steel meat hooks. Napoleon Rodeo kettle grill has a hinged chrome plated steel cooking grate so that you can easily add charcoal when you’re grilling. You can also adjust the cooking grate at three height levels for direct or indirect cooking. When you’re done grilling, clean up is a snap with the removable ash container.